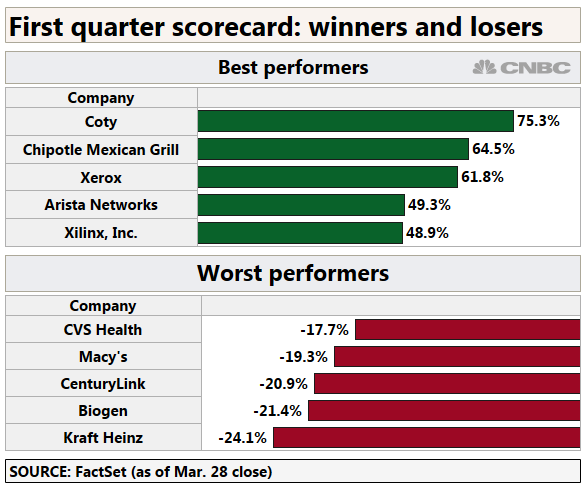 Cosmetic's giant Coty and fast-casual restaurant chain Chipotle Mexican Grill were the best-performing stocks in the first quarter, followed by Xerox, Arista Networks and Xilinx. Kraft Heinz, Biogen and CenturyLink rang up the rear, as they all fell more than 20 percent. 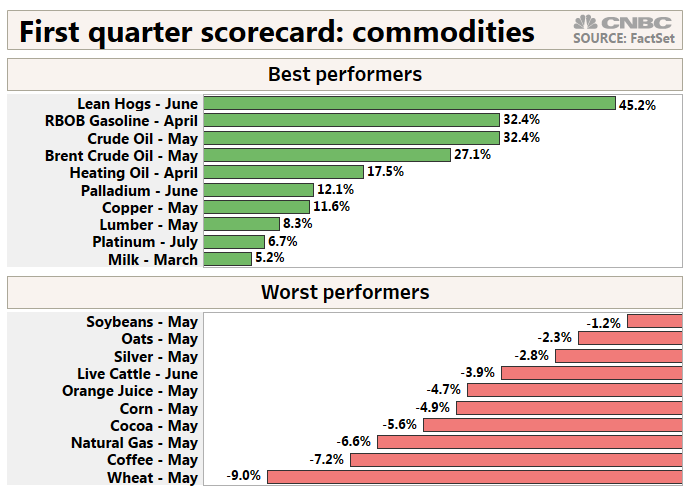 The first quarter marked the best start to a year for the S&P 500 since 1998.
Commodities like lean hogs, gasoline and crude also surged in the first quarter. The S&P 500 rose 13.1 percent this quarter and notched its best start to a year since 1998. The broad index also posted its biggest one-quarter gain since 2009. Accompanying the S&P 500 in its ride high to start off 2019 are the Dow Jones Industrial Average, Nasdaq Composite and the Russell 2000, which tracks small-cap stocks. The 30-stock Dow gained over 11 percent, while the tech-heavy Nasdaq rallied more than 16 percent. The small-caps Russell shot up 14.2 percent. Leading the way higher for U.S. stocks this quarter was the tech sector, which skyrocketed nearly 20 percent in the period. Tech giants Apple and Microsoft — two of the biggest publicly traded U.S. companies — rose more than 16 percent each for the quarter, but the sector's best performer is an unlikely stock: Xerox. Shares of the copy and fax machine maker are up more than 60 percent to start off the year. They are also among the best-performing stocks in the entire S&P 500. 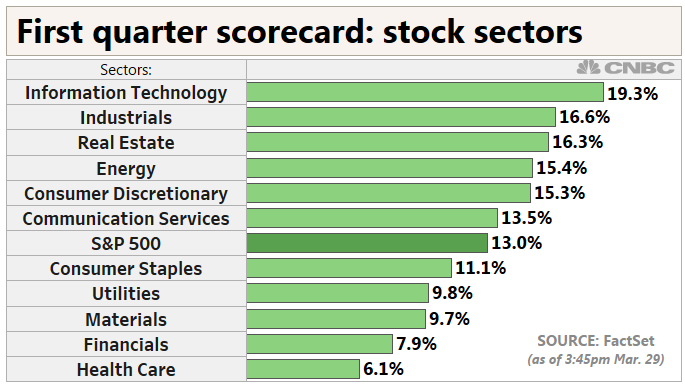 Not every sector performed as well, however. Health care and financials are the biggest laggards among S&P 500 sectors, rising around 6 percent and 8 percent, respectively. Global stocks also performed well this quarter, with Irish shares surging more than 30 percent, more than doubling the S&P 500's performance year to date. Stocks in Greece, Italy and Canada also rose more than 13 percent each. Japan's Nikkei index is up more than 5 percent along with Indian stocks, lagging their global counterparts. 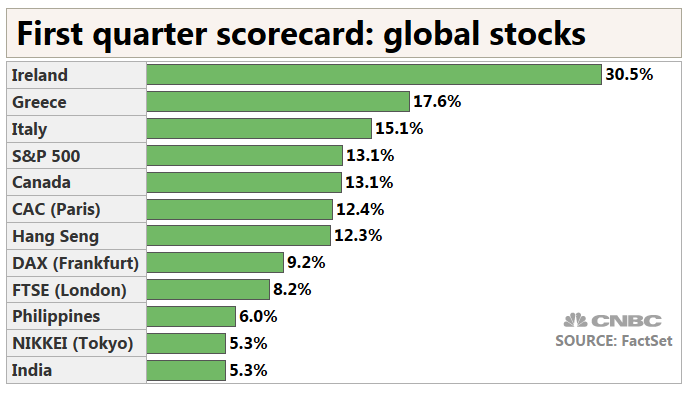 Stocks weren't the only assets to do well in the first quarter, however. —CNBC's Gina Francolla, Chris Hayes and John Schoen contributed to this report.